Have you ever considered a Las Vegas outdoor wedding? You probably have the picture in your mind; your wedding day. There are many things you can do to make your day as outrageous or as elegant as you desire. There are wedding planners, wedding planning checklists, and planning books that can assist you with all the small details, so you can have a day you will always remember. While there are many ways you could enjoy an outdoor wedding, you should check out several possibilities. There are some amazing venues for the location of your Las Vegas outdoor wedding, are you looking for views?, golf course, lake front, your wish is our command! Springs Preserve - Settings available for up to 500 guests in lush gardens, beautiful trees and the starry night sky! Catering is also available for you. Lake Mead – Perfect for the water lover. You can exchange your vows as you gently glide across the manmade lake, or step on one of the sandy beaches as you overlook the lake and all the views that are included in your Las Vegas Outdoor wedding. Spring Mountain Ranch – Another good choice for an outdoor wedding, this historical ranch mixes a combination of Hollywood glitz and country charm. Revere Golf Club - golf course views and exquisite backdrops. Wedding planner on site for your special day. Choose from several locations throughout the upscale golf club. Lake Las Vegas - Stunning elegance in several locations of choice, Lake Las Vegas Resort has a number of romantic and scenic venues for weddings in Las Vegas. Each distinctively beautiful venue creates a truly unique backdrop for spectacular weddings in Las Vegas, Whether you envision an intimate ceremony on a white sand beach, a grand celebration in a Tuscan-inspired setting, or a private reception on a luxury yacht, Lake Las Vegas Resort provides the perfect venue resource. Gazebo weddings - The Outdoor Gazebo wedding package includes the following,Daytime Ceremony Under the Outdoor Gazebo, Two-rose Presentation, Boutonniere, 24 Poses & Proofs, Wedding Coordinator, Music, Gazebo Fee, Live Internet Coverage of Your Wedding, Internet Archive of Your Wedding for 3 Months, Seating for up to 36 Wedding Guests, Complimentary Limousine Service to and from the Viva Las Vegas Wedding Chapels, deluxe packages are also available. The Grove - Catering too! Of course there are other locations that you and your betrothed can discover. However, before you plan your glorious day, be sure to contact the location and find out their policy on weddings. 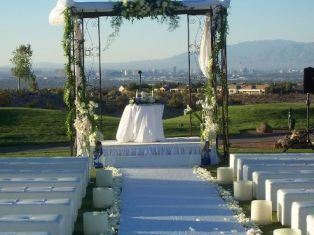 Planning a Las Vegas outdoor wedding can be a great way to make your special day everything you have dreamed about. Take some time, do some research, and have a day to remember. Return to "Weddings In Las Vegas" from "Las Vegas Outdoor Wedding".